Blue Creek Aviaries is located in Central New York in the Finger Lakes region. My goals are to propagate ornamental species, share my passion for aviculture with others, and aid others in establishing their own collections. Furthermore, I strive to aid in the conservation of the endangered species I own that have an uncertain future in the wild. Such species need to be preserved in captivity for future generations to enjoy. 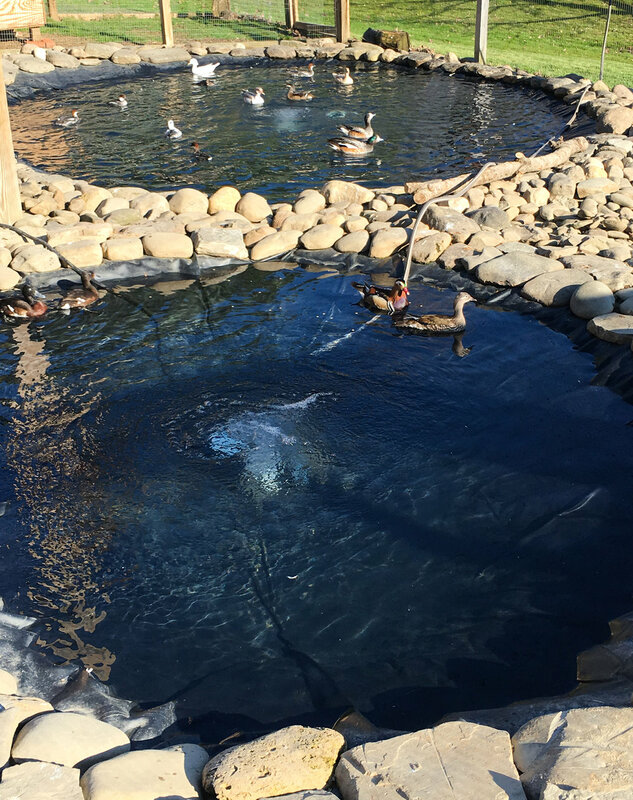 Blue Creek Aviaries is my personal small-scale collection of eight ducks species, one goose species, seven pheasant species, and one peafowl species. I feel that I am best able to tend to the needs of these lovely birds by keeping the quantities limited, as less is more when you are talking about birds and breeding them. My website reflects what I have found works with my birds, but keep in mind that there is not one set method for a healthy collection and breeding success. Below you will find videos of some of my ducks—be sure to click on HD for better video quality. The facilities include two duck aviaries that are 40' x 40', as well as additional smaller pens for pheasants and peafowl. The ponds are equipped with a drainage system to allow for bi-weekly water changes. Since constant running water is not a possibility, I kept the number of ducks to a minimum to keep the water as clean as possible in between water changes. Previous customers may recall me having more species, but I cut back to focus on some of my favorite species and the sake of college. The next few pictures are of the aviaries. In terms of breeding the birds, I try to encourage natural nesting, though when necessary, I use R-com 20 Max Incubators. These incubators allow one to closely monitor the temperature, humidity, and frequency of turning quite easily. For artificial brooding, I use wet brooders from Leucopsis Products. These aquatic rearing cubicles work wonderfully to raise ducklings, as they have access to water from day one (betters their plumage) and begin to eat more easily. I recommend these with the highest regard—the investment pays off. In the avicultural trek there are setbacks, but you can only learn from them and get better. I feel that this has allowed me to advance and come to conclusions of what works well. I started with basic species and worked my way up to more challenging species, and I strongly recommend others to do so as well. It is not always the best idea to jump straight into the higher-end species that have additional requirements. I hope everyone finds my website helpful and enjoys the pictures, but please do not use my pictures or manipulate them without my permission. All of the pictures on this site were taken by me, Alex, and they are either of my current or past birds. I am always willing to take more pictures on request of various species or of the birds you are considering buying, so do not hesitate to ask! Also, do not forget to like Blue Creek Aviaries on Facebook so that you can keep updated and enjoy the most recent pictures of my birds. Blue Creek Aviaries is run by Alex Levitskiy, who was always around birds since he was a little kid. His father fostered Alex's passion for birds by keeping domestic birds like pigeons and chickens. When Alex was in fifth grade, his parents purchased him his first peafowl. Around that age, Alex's passion for birds grew with the acquisition of entry-level birds, such as Mandarin Ducks and Golden Pheasants. Alex has taken a keen interest in ornamental birds and has been adding on various species to his collection. Alex takes pride in his birds and is always willing to discuss them! In an age when very few young people are into aviculture, Alex wishes to spread awareness of aviculture and help foster a spark of interest in birds in as many people as possible. Alex currently studies Animal Science and Biological Sciences at Cornell University, with the intention of attending veterinary school in the future. The collection is graciously maintained by his family during Alex's academic pursuits. If you have any questions then do not hesitate to fill out the form below to get in touch with me. You may also message me via the Blue Creek Aviaries Facebook page.